Sometimes you don’t want or need to heat your entire home to the same temperature. Why waste the energy to maintain a comfortable temperature in areas you aren’t even using? If you are looking for single area heating and cooling solutions, we can help. We offer high-quality ductless HVAC systems that allow you to heat and cool your home only where you need it. Ductless HVAC systems deliver efficient cooling and heating with a lot more flexibility than traditional ducted systems. They can be used to provide whole-home comfort or offer single-zone climate control. 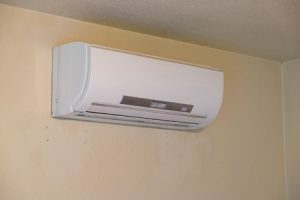 Whether you have an addition that is not connected to your existing ductwork or you want to save money on your energy bills by only heating and cooling rooms as needed, a ductless system is an ideal single area heating and cooling solution. As the name implies, ductless HVAC systems heat and cool homes without pumping air through a system of ducts. Instead, a liquid refrigerant is used to basically move heat from one area to another. During the summer, the system moves the heat from your home outdoors. When in heating mode, these systems move warm air into your home. Ductless systems have individual room units to circulate the air and provide zoned comfort. These room units are connected to a central outdoor condenser by a few refrigerant tubes and electrical wires. Because there are no ducts to install, setting up a ductless system is faster and much simpler than setting up a traditional HVAC system. At Rowell’s Services, we sell, install and maintain ductless HVAC systems for single area heating and cooling. Whether you need to supplement your existing system to account for a new addition or you would like to take control of your heating and cooling bills by zoning your home, we can help. To find out more about these systems, how they work and if one is right for your home, please call 603-934-4145.